When Manipuri dancers Waikhom Biken and Senjam Hemjit took to the stage at Delhi’s India International Centre’s auditorium last week, as part of the ArtEast festival, their dance piece 1 sq. ft brought back disturbing flashbacks. Images of Syrian refugees escaping their homeland, sitting atop boats, dressed in life jackets and lost in the Mediterranean Sea came rushing to the mind with this dance performance, choreographed by award-winning choreographer Surjit Nongmeikapam, when the two dancers recreated the body movements of rowing a boat using a tall bamboo stick. The life-threatening journey taken by immigrants in the hope of a better place form the crux of the 30-minute dance piece. 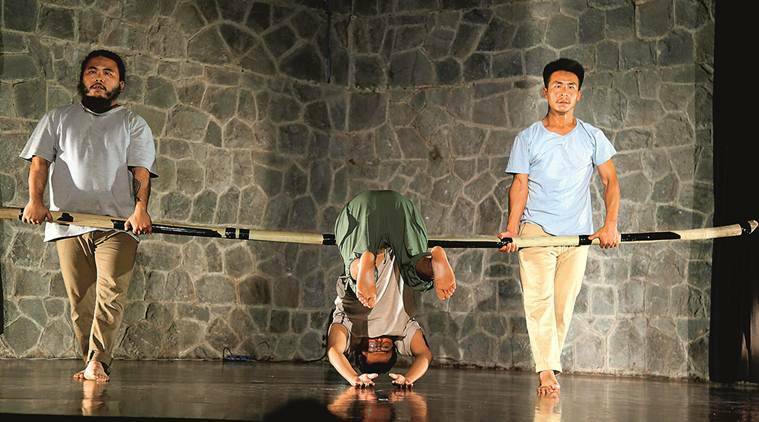 Manipur-born Nongmeikapam, 32, is dragged by co-dancers Bike and Hemjit, who have performed alongside him in his dance productions in the past, as his body lies atop a bamboo stick held by the duo, indicating the onslaught of sickness on their sea journey. We can’t help but remember the haunting image of the deceased body of the three-year-old Syrian refugee Aylan Kurdi that washed up on a Turkish beach in the September of 2015. His works have toured several countries including France, the US, Singapore and the UK. His last piece, Nerves, gave voice to the indigenous communities of Manipur, where dancers in tribal loincloth and military footwear, took centre stage.